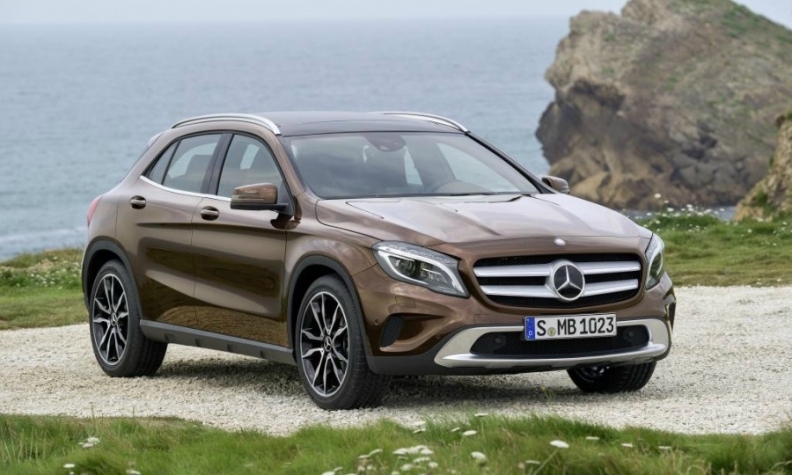 Mercedes will expand its compact lineup with the introduction of the GLA next month. FRANKFURT (Bloomberg) -- Mercedes-Benz brand sales grew faster in January than sales at BMW and Audi, helping the carmaker to further close the gap in deliveries with its premium rivals. Mercedes posted a 15 percent gain last month to 109,500 vehicles on a 32 percent surge for its compact cars. Sales at Audi rose 12 percent to 124,850 cars, while BMW advanced 9 percent to 117,200 vehicles. Daimler CEO Officer Dieter Zetsche is rolling out 30 new vehicles by the end of the decade, 13 of which will have no predecessor, in an effort to regain the sales advantage the company lost to BMW in 2005 and Audi in 2011. "Daimler's new models are giving them a lot of tailwinds," said Frank Biller, a Stuttgart-based analyst at LBBW. "They are currently benefiting from the model cycle but shouldn't relax. They need to continue to introduce new vehicles and fight for the customer." All three German premium brands posted record sales last year and aim for further growth in 2014. "Our target is to increase overall global sales for a fourth successive year," Ian Robertson, BMW sales chief said in a statement today. January deliveries of BMW's X3 SUV grew 18 percent, and the 5-series sedan advanced 14 percent. China sales for the BMW Group, which also includes the Mini brand, gained 22 percent. For the first time since 2010, Mercedes last year posted a higher growth rate than BMW, and in the final months of 2013 grew faster than Audi. Mercedes brand's full-year deliveries increased 11 percent to 1.46 million, compared with Audi's 8 percent increase to 1.58 million BMW brand sales rose 8 percent to 1.65 million. Mercedes's China sales last month increased 45 percent as the flagship S class gained 69 percent globally. Mercedes hasn't been able to produce enough compact vehicles to meet demand, Zetsche told analysts last week. The company is introducing a small SUV dubbed the GLA in March as its fourth compact model, joining the CLA coupe, A-class hatchback and van-like B class. The CLA, introduced last year, is winning over customers from BMW in the U.S., with 82 percent new to Mercedes, Zetsche said last week. Audi's January sales in China rose 18 percent to 44,500 vehicles on demand for its top-of-the-line Q7 SUV. Global growth was boosted by a 67 percent surge for the A3 compact, and 73 percent gain for compact Q3 SUV.